We have recently held two first aid courses and over 20 of our members attended. If you would like to attend a future course please contact Phil Gasson…. West Surrey CTC cyclists rode over 120,000 miles on Club rides last year!. 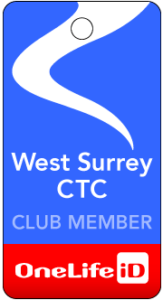 We are West Surrey CTC, a cycling club whose members live in and around the towns of Guildford, Woking, Godalming, Farnham, Haslemere, and Camberley. Cycling in and around Surrey has so much to offer for all levels of cyclists. The West Surrey group offers its members a programme of rides to suit all levels and ability, all of this in a way that is safe, enjoyable and fun. Experience the camaraderie of riding with others, with the added bonus of getting assistance should mechanical problems strike! You’ll never get left behind. We organise day and half day rides on different days, from different places within our area, to suit different abilities. Our rides are social and explore the countryside (and tea shops!) of Surrey. We organise weekend & longer tours/holidays in the UK and abroad. We organise events, both cycling & social. We campaign for cyclists’ rights. We run a website with blog and forum so it’s easy to keep in touch. In summary, gorgeous scenery in Surrey and the surrounding counties, safe group rides, led by competent ride leaders, assistance if breakdown, you don’t need a map as we guide you and lots of camaraderie & fun guaranteed. Take a look at the “Join Us” section of our website and select the group ride which matches your ability. If the information we provide about any particular ride isn't enough to help you choose whether it's OK for you, feel free to telephone or email the Group Ride Leader who will be very happy to supply further details. To be kept up to date with the latest news and to receive emails about any changes to our rides, please click here. The club is a member group of CTC - the National Cycling Charity, which works to protect the interests of cyclists. There are hundreds of CTC groups around the UK; as a member you can ride with any of them, as well as take advantage of the many other benefits that membership brings with it.